Irrespective of the industry sector, it is necessary to have the latest technology trend’s mobile app. There are varied benefits of having a mobile app because it can take your business to the next level at a rate of knots. The transportation industry is the second largest vertical investing in IoT, spending upwards of $78 billion in 2016 where a significant portion of this investment goes towards freight monitoring. The freight and public transportation vehicles are being equipped with sensors which help schedule maintenance, optimize fuel consumption, and train drivers with IoT in transportation, these vehicles can monitor the driver behavior too. 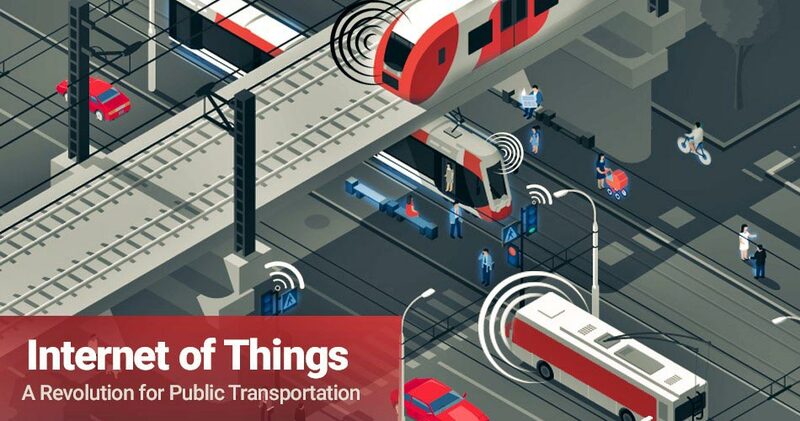 Many individuals and cities have greatly implemented IoT technology in public transportation services around the world and have made public life easier. Internet of Things has made public transportation more efficient and safer as well as more comfortable for commuters. HOW IOT HAS CREATED A MORE EFFICIENT PUBLIC TRANSPORTATION SYSTEM? The public transportation system has connected systems in place like the connecting trains display arrival and departure time so passengers can plan accordingly. With their smartphones, they can know the exact time to leave their houses to catch a train or the bus. Various out of the box features like Predictive Analytics came into existence when a large amount of data is collected for analysis. The concerned person receives alert well before the time when any part of it needs maintenance, instead of waiting for that part to break down. Not only this IoT manages the unforeseen or the unexpected events very efficiently. Managers can send alerts if there is a problem with train or specific public transportation method. HOW IOT HAS ENHANCED SAFETY? Ever experienced or thought if a part of bus breaks while passengers are riding at the same time, this can result in a traffic accident. But with IoT in transportation, predictive analytics alerts the manager about when a particular part needs replacement so that it reduces the chances of the accident as well as downtime. HOW IOT HAS CATERED BETTER COMMUTE EXPERIENCE? What if while traveling you can work or check your email on the way with IoT, many smart features have been included at bus and train stops. One can track the real-time location and can find directions accordingly. IoT features have made the ride more enjoyable by catering so many smart features. HOW IOT IS MAKING SIGNIFICANT FINANCIAL SAVINGS? IoT in transportation offers more revenue that helps people to make optimum use of transportation facility. Undoubtedly, transportation business has become a digital entity now. Real-time alerts well before time save the device before any hazardous situation occurs. This, in turn, saves time and money for every situation. Adoption rates for IoT are already accelerating at a faster pace i.e. nearly 43% of enterprises world have adopted IoT. The transportation industry is continuously investing in IoT to transform their business. One of the recent forecasting by PwC says that a total of $6 trillion will be spent on IoT technologies between 2015 and 2020.McKinsey and Company estimated that IoT could have an annual economic impact of $3.9 trillion to $11.1. It is very much clear that the Internet of Things has made a global impact. As the IoT came into action, it has leveraged the power of data from sensors to not only detect the asset failures but to also eliminate them with a timely action. With the Internet of Things, there have been a lot of opportunities and possibilities such as self-driven cars which have paved a better way for the Internet of Things. Obviously, Internet of Things technology has improved the passenger experience for public transportation by catering the real-time vehicle tracking feature, improved responses, and alerts for the unexpected events and personalized travel information. As cities have become more congested and polluted, people are always looking out for ways to go green and choosing public transportation as the attractive option rather than their own personal transportation facility.